SmartCal MN25208A — это серия 2-портовых модулей автоматической калибровки, работающих в частотном диапазоне от 300 кГц до 8,5 ГГц. При заказе MN25208A с Опцией 1 (MN25208A-001) устройство поставляется с двумя разъемами N-тип, «розетка». 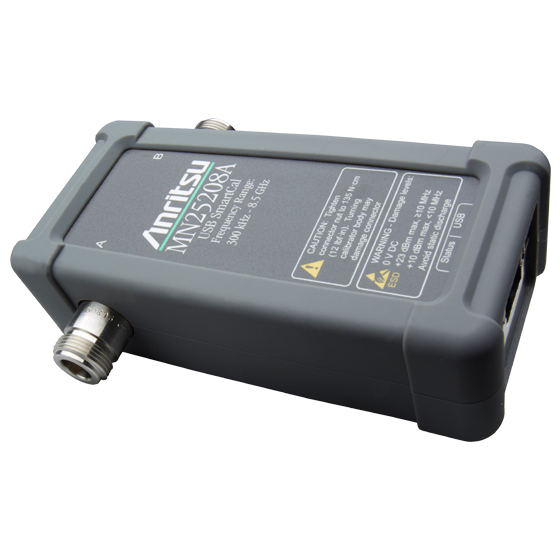 The SmartCal MN25208A is a series of 2-port auto calibration units covering a frequency range from 300 kHz to 8.5 GHz. The MN25208A has 3 different connector options which include a set of N(f), K(f), or 3.5 mm(f) type connectors. The MN25208A delivers automatic, fast and error-free calibrations for any ShockLine VNA. The SmartCal automatically powers on via an USB connection and loads calibration kit coefficients from on-board memory into the ShockLine software. The SmartCal is ready to use immediately after detection by the VNA because it doesn't require warm-up. SmartCal improves productivity by providing easier and faster single connection calibrations. Port auto sense and port mapping reduce errors and make multiport calibrations easier. The MN25208A, along with easyTest, can also be used in guided graphical test procedures to further simplify complex calibrations.